My mom and cherries are like two peas in a pod….she absolutely LOVES them! When cherries are in season, my mom will simply pop them into her mouth just like you would grapes. Recently we all went shopping at McKinney’s downtown historic square. 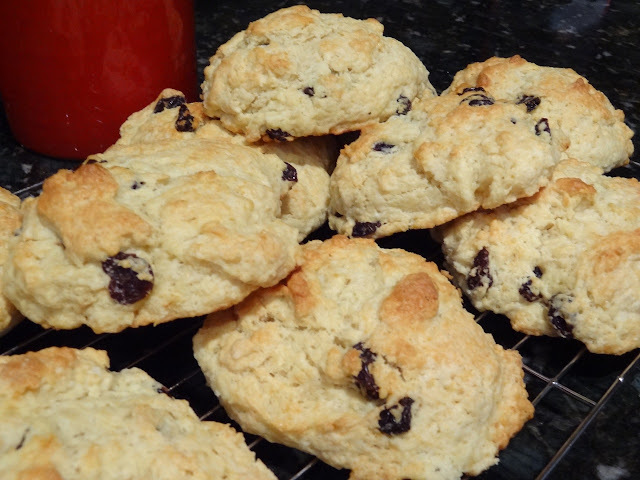 There we bought some Amaretto Cherry Preserves from a cute kitchen shop and all we could think about afterwards was making scones and biscuits so we could try out our cherry preserves! When we arrived home, that’s exactly what we did…. we made cherry-buttermilk scones! 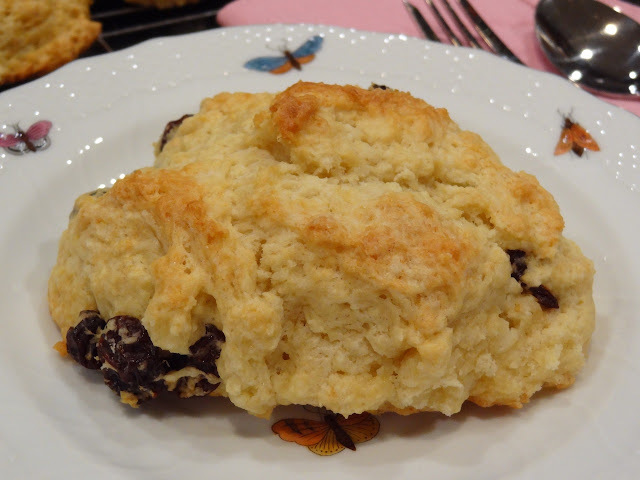 If you’ve never eaten a scone, it’s time to try one. They remind me of a flaky biscuit, except that they are sweet. They are super easy to make and we just love them! 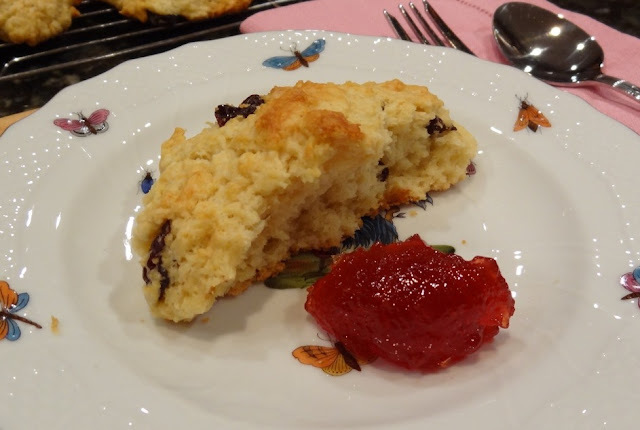 The amaretto cherry preserves went perfect with our scones, but you could also top them with a pat of butter served alongside a cup of tea like the British do! “Quite lovely,” as the Brits would say. Enjoy! Pulse butter and dry ingredients. 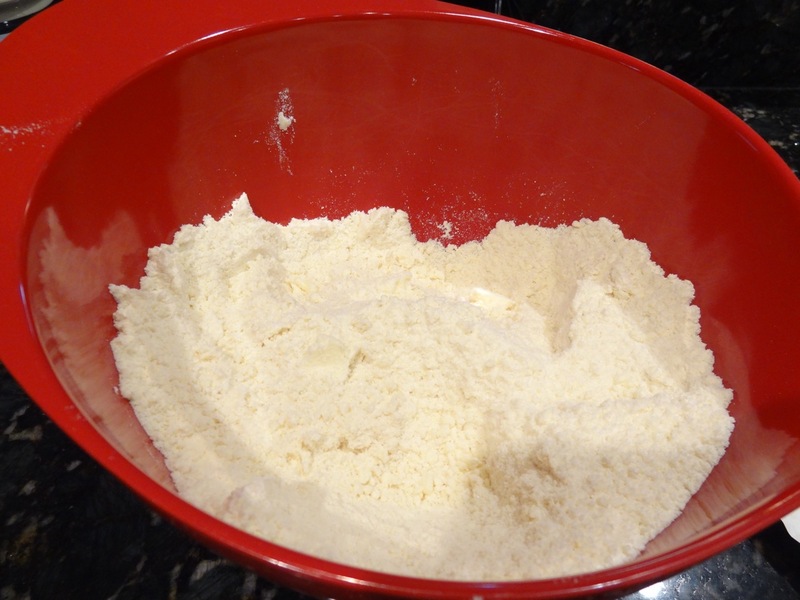 Transfer dry ingredients to a large bowl. Whisk eggs, buttermilk and vanilla. 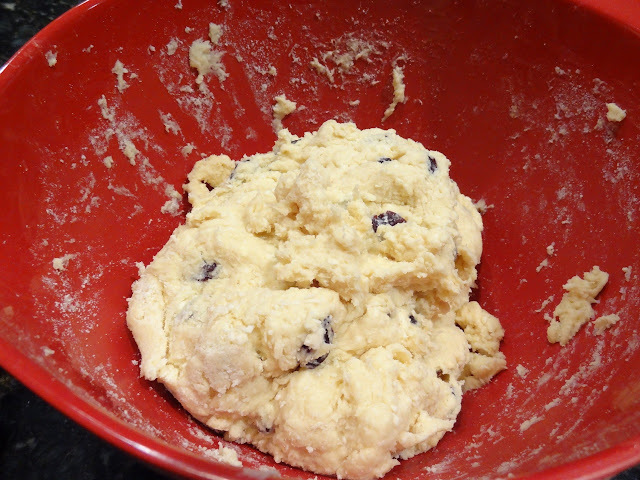 Pour wet ingredients into dry and add dried cherries. 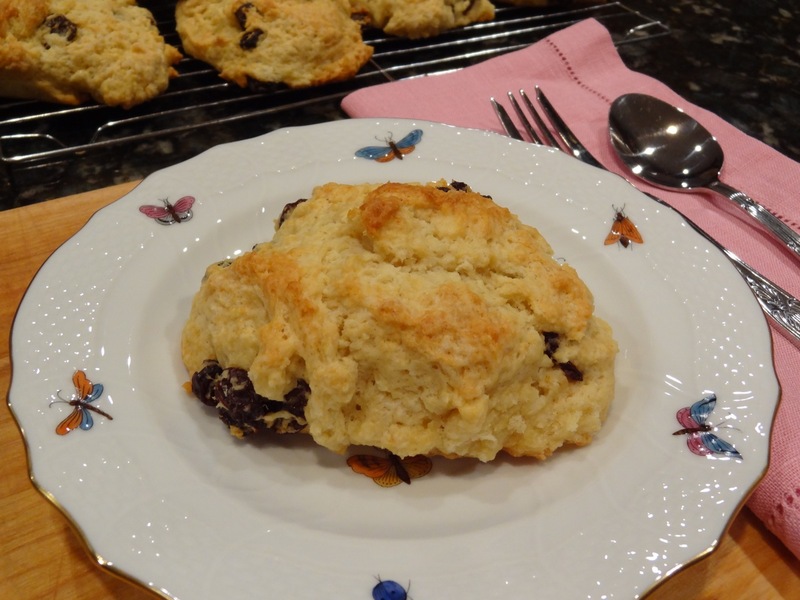 Use 1/2 cup measuring cup to scoop scones onto baking sheet. 1. Position your oven racks so one is in the center of your oven. Line baking sheets with parchment paper. Preheat oven to 400 degrees F.
2. 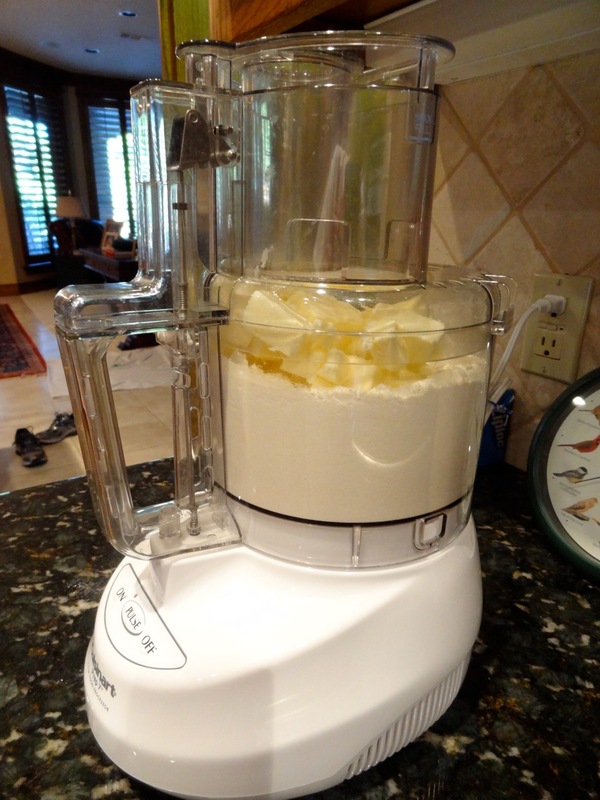 Dump the dry ingredients into the bowl of a food processor. Pulse a few times to mix. 3. Add the butter all at once, and run the food processor for 15 seconds. Switch to pulse, and continue pulsing until there are no chunks left and the mixture looks like moist crumbs. Be careful not to over-mix the ingredients. Remove the blade from the food processor, and dump the crumbs into a big bowl. 4. 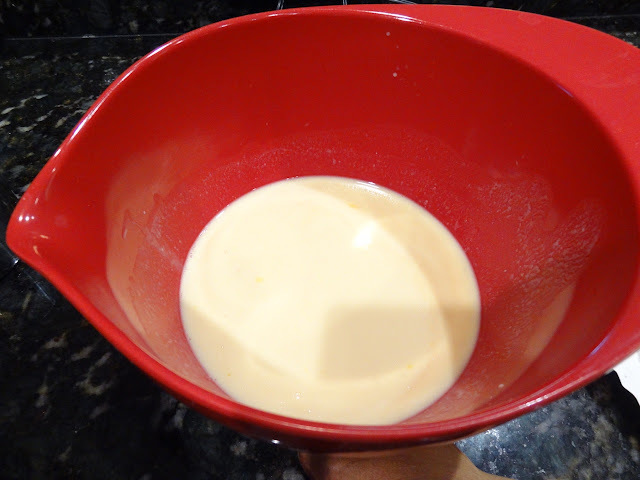 In another small bowl, whisk the eggs to break up the yolks. Whisk in the buttermilk and vanilla. Stir in the cherries. 5. 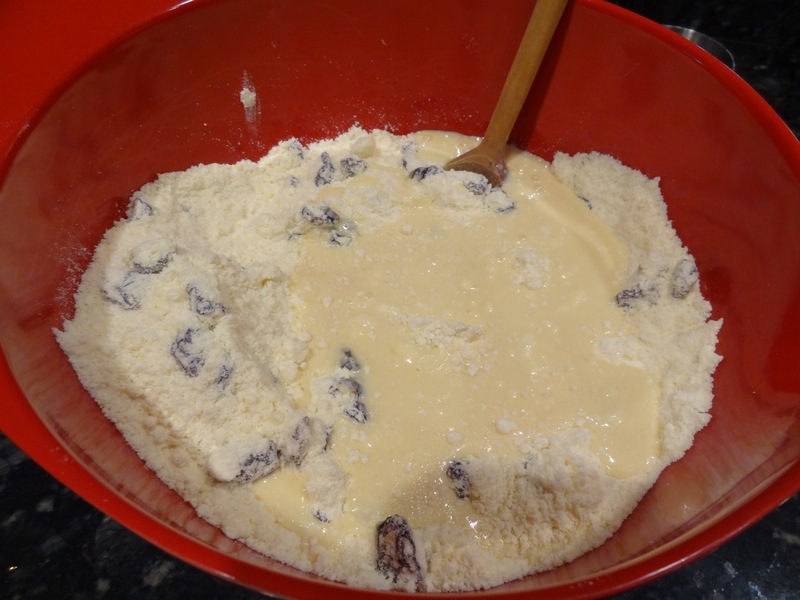 Pour the wet ingredients into the bowl with the ‘crumbs’ and stir with a wooden spoon. Stop as soon as no flour is visible. You don’t want to work the dough a moment longer than necessary. 6. 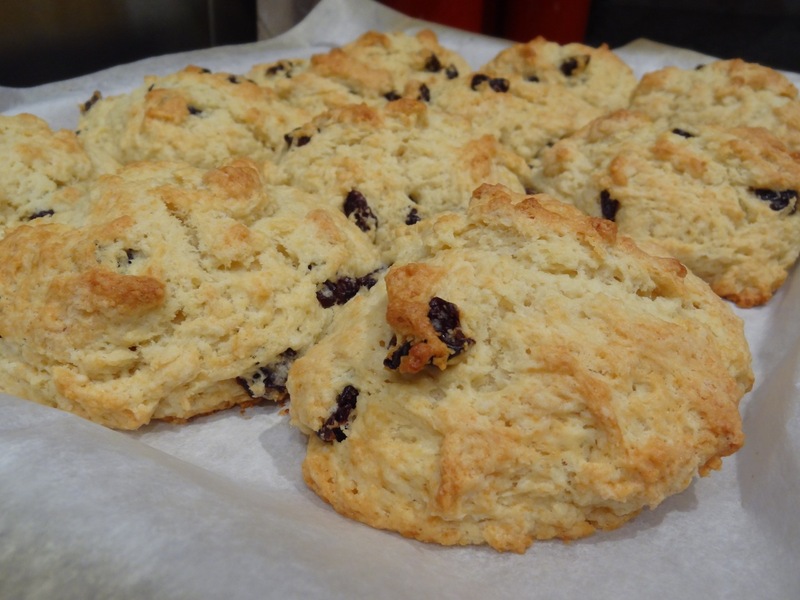 Use a half-cup measuring cup or your hands to scoop the batter out, and plop it onto the baking sheet, leaving 2 inches between the scones. 7. 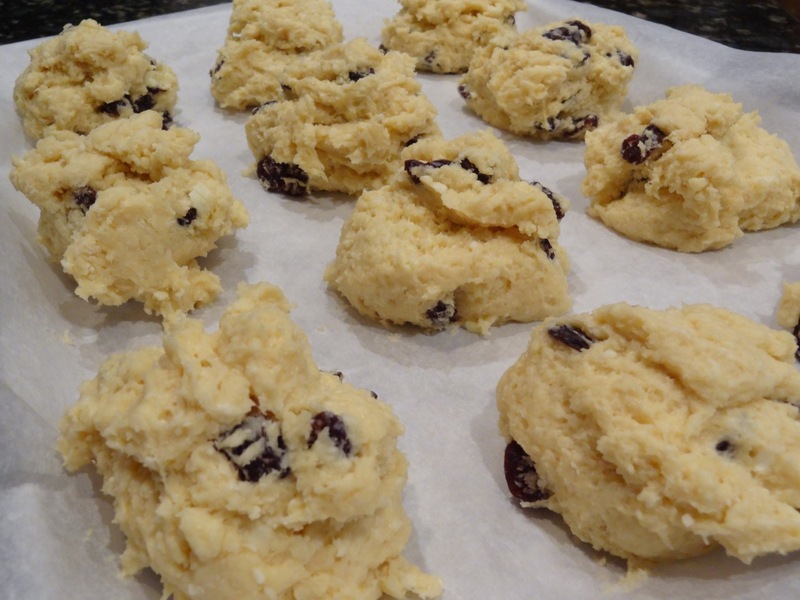 Place the baking sheet on the center rack in the oven, and bake the scones for 25-30 minutes, or until the tops are golden brown and a small knife or toothpick inserted into the center of one comes out clean. 8. Remove the baking sheet from the oven, and place it on a rack to cool for a few minutes. Use a spatula to transfer the scones to the rack or serving dish. Serve fresh out of the oven or at room temperature.